This PDF 1.5 document has been generated by Microsoft® Word 2013, and has been sent on pdf-archive.com on 04/07/2014 at 08:09, from IP address 117.211.x.x. The current document download page has been viewed 398 times. File size: 500 KB (8 pages). Professor, Saveetha School of Engineering, Saveetha University, Chennai, India. Fomerly Director, Centre for Environmental Studies, Anna University, Chennai, India. be used effectively for developmental projects. Environmental Impact Assessment (EIA) is recognized as a key tool for sustainable development. Balancing local socio-economic, political and ecological priorities is particularly challenging . challenges for effective use of EIA and its methods in detail. goals, as a tool for local or national development planning, are closely related, but not identical. and Biodiversity Conservation Act were also introduced in 1999.
and the same revised in 2012. Environmental Protection Bureau has to monitor EIA. Directive on EIA was introduced in 1985 and amended in 1997. Strategic Environmental Assessment directive was also introduced. Environmental Quality Act 1974 was introduced. 1991, where EIA is included. EIA was implemented in Dutch legislation in 1987.
and provide data on which managers can take informed decisions to avoid environmental damage. The overview of the EIA process is represented in figure 2.
damaging and costly negative impacts, and maximize positive impacts , . without compromising the ability of future generations to meet their needs and aspirations’ . is flexible and has the capacity for self-correction . been identified apart from the selection of team members. identifying those, which are worthy of a detailed study. prior to the project's implementation. to procedure a complete account to each project alternative. 8. Post audits: These are made to determine how close to reality the EIA predictions were. different types. The following are the most commonly adopted methods. by the assessor but no other assistance is provided to guide the impact identification process. to be measured to characterize each component. to elicit information about possible impacts and their likelihood Importance. further studies, the inexpensive nature (also true for checklists) and their comprehensiveness. generation without affecting the present. Development Bank, Manila, The Philippines. International Journal of Water Resources Development, 8: 2, 113-117. 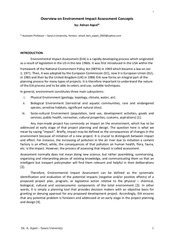 Environmental Impact Assessment Review, 35: 23-36.
and Forest, Government of India. Environment and Forest, Government of India; 2006.
. WCED (1987), “Our common future”, Oxford University Press, New York. Irrigation”, Drainage and Flood Control Projects, HR Wallingford, UK. World Summit on Sustainable Development (WSSD)”, New York, Fargo, USA.
. Wramner P., 1989, Procedures for EIA of FAO's field projects. FAO 1989, Rome, Italy. countries”, United Nations University Press Toronto, New York, Paris. Sudan EIA experience”, Nile Basin Water Engineering Scientific Magazine, Vol 1.
published more than 25 Research papers in the International and National Journals and in Conferences. retirement, presently working as Visiting Faculty in Centre for Water Resources, Anna University, Chennai. This file has been shared by a user of PDF Archive. Document ID: 00172419.